MarsVR Milestone Completed: MDRS Has Been Fully Scanned! 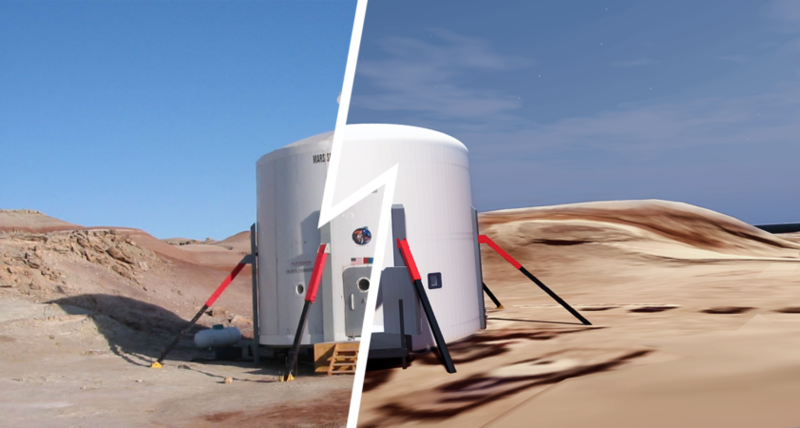 The Mars Society is pleased to report that a technical team visiting the Mars Desert Research Station (MDRS) in Utah as part of the preparation for the MarsVR program has completed all of its virtual scans ahead of schedule. Fully-funded by a May 2018 Kickstarter campaign, MarsVR will provide a fully interactive virtual reality platform for serious research to support human Mars exploration and pre-sim crew training. Over 15,000 high-resolution photos of the terrain around the MDRS facility have been taken using drones, cameras and other scanning equipment. In addition, the team added full coverage of the inside of the station, including some amazing 360 panoramas that one can walk around in. Many of the 360 panoramic scans of the MDRS interior were taken using a donated Matterport camera and are now ready for virtual viewing. This complete scan of the MDRS Hab interior allows you to walk around and (for the first time on Matterport) go inside all of the crew staterooms and other areas of the hab. This is our primary science lab facility with all the equipment and supplies needed for biology, geology, and other types of research to be done onsite. This solar observatory has been recently converted to be a Sun-focused observatory, but was our original astronomical observatory. It was built with funds contributed by the Elon Musk Foundation back in the early 2000s. The RAM is our engineering workshop where we can work on projects requiring tools and to repair existing hardware. This will be a great place for future mission content. Stay tuned for further updates about the Mars Society’s MarsVR program!